MONTGOMERY – Alabama Senate President Pro Tem Del Marsh pre-filed legislation Friday that will consolidate and reorganize the state’s public safety and law enforcement functions. Marsh said the proposal, which he will sponsor, is cosponsored by 18 members of the Senate Republican Caucus and is a cornerstone of the Legislature’s 2013 agenda aimed at reducing the size and cost of government. Conservative cost-savings estimates show a potential savings of $260 million over 10 years by consolidating more than 20 agencies with law enforcement or investigative missions down to seven – compared to an average number of nine in neighboring states. 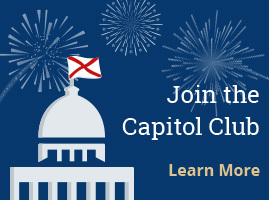 Senate Majority Leader Jabo Waggoner (R-Vestavia) said the Legislature has a responsibility to ensure taxpayer resources are utilized in the most cost-effective way possible, and credited Senator Marsh for leading that effort. Senate Bill 48 will be referred to the Senate Committee on Fiscal Responsibility and Accountability, chaired by Senator Phil Williams (R-Gadsden). Williams said this bill exemplifies fiscal responsibility and accountability and he looks forward to addressing it in his committee. The public safety reorganization legislation is based on recommendations from Marsh’s Initiative to Streamline Government, resulting from a months-long effort by a nine-member Public Safety Study Group who brought hundreds of years of combined experience in federal, state and local law enforcement, state regulatory boards, county government, academia and private sector security operations.